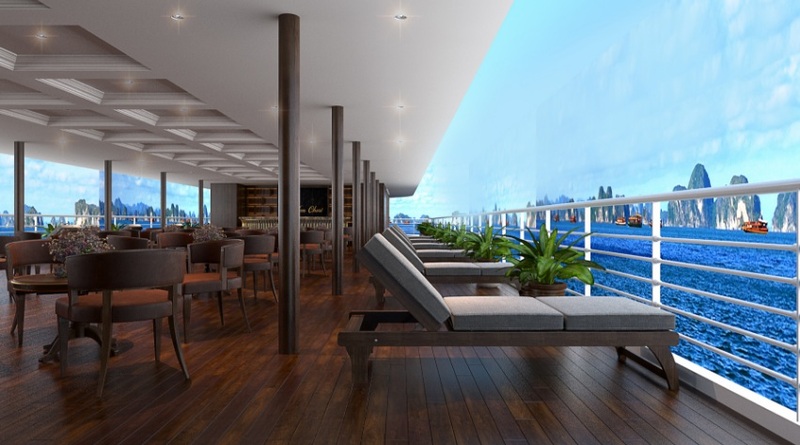 have designed distinctive itineraries sailing to the area of Ha Long – Lan Ha Bay which is not frequented by tourists.Mon Chéri Cruises offer 18 stylish cabins alongside an elegant restaurant and bar, fitness facility and spa service. Cruising with Mon Chéri, you will be pampered while exploring the hidden charms of Lan HaBay, enjoying the breathtaking scenery of enormous limestones, pristine beaches and mysterious caves that cannot be found anywhere else on earth . 9:00-9:30: You are picked up at your hotels in Hanoi's Old Quarter and proceed to the highway directly to Cat Hai Port in Hai Phong city for the cruise. 11:45: We arrive at office in Cat Hai Port. You are welcomed by our crew team at the port. 12:00: Embark Mon Chéri Cruises. You will be welcomed with a drink and cold towel. You are then introduced to the cruise, and given safety instructions before checking into your cabin. 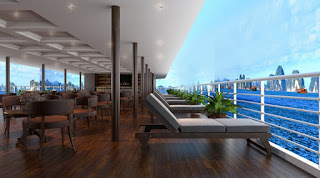 Mon Cheri will sail and you will have lunch in Mon Chéri's luxury restaurant. You will see the beauty of the canals on the way to Halong Bay. 15:00: We arrive at Three Peach beach area in Lan Ha Bay, where is a famous destination for swimming and kayaking. This region is known for its pristine beaches and spectacular beauty, having about 400 fascinating limestone islands and caves. 17:30: You will return to Mon Cheri ship where you can admire the magnificent sunset over the Gulf of Tonkin and enjoy a complimentary sunset party. 19:00: Dinner is served with delicious local food. 7:15: Breakfast is served while boat is cruising to the Dark and Bright Cave (Sang Toi cave) where you take bamboo boat to visit the cave. 10:00: Take part in cooking demonstration to learn about our Vietnamese cuisine of traditional spring rolls. A buffet brunch will be served. 11:30: Check out boat and return to port. 12:00: Get on bus to Hanoi. 9:00-9:30: You are picked up from your hotel in Hanoi's Old Quarter and proceed by highway directly to Cat Hai Port in Hai Phong city for the cruise. 11:45: We arrive at the office in Cat Hai Port where you will be welcomed by our crew. 12:00: Embark Mon Chéri Cruises. You will be served a welcome drink and provided with a cold towel. This will be followed by a cruise briefing where you will also be given safety instructions before checking in to your cabin. We will set sail and you will have lunch in Mon Cheri's luxury restaurant while enjoying the beauty of the canals on our way to Halong Bay. 15:00: We arrive at the Three Peach beach area in Lan Ha Bay, which is a famous destination for swimming and kayaking. This region is known for its pristine beaches and spectacular beauty, having about 400 fascinating limestone islands and caves. 20:30-0:00: After finishing dinner, you can enjoy the landscape of the bay at night up on the top deck, relax with peaceful music, enjoy drinks from the bar or try your luck at squid fishing, watch a movie or just chill in your room. 6:00: It is perfect to start your day in the early morning to admire the marvellous sunrise or attend the Tai Chi class on the top deck. Have a fragrant cup of coffee made from a special blend which was created just for Mon Cheri, or a refreshing cup of tea. 7:30: Buffet breakfast is served. 06:00: Wake up early to start your perfect day with Tai Chi class or watch the sunset on the top deck. 7:15: Breakfast is served while the boat sails to the Dark and Bright Cave (Sang Toi cave) where you will take a bamboo boat to visit the cave. 9:30: Check out your cabin while cruising back to the dock. 10:00: Take part in a cooking demonstration to learn how to prepare the Vietnamese traditional spring rolls. 11:30: Check out of Mon Cheri and return to port. 12:00: Luxury limousine transfer back to Hanoi. 15:00: Arrive at Hanoi. End of the trip. Special note: Cruise itineraries and schedules are subject to change without pre notice, depending of the weather and operating conditions.